University of Arizona received a A.
U.S. News & World Report's ranking of 58 out of 117 of National Universities Top Public Rankings was a major contributor to this grade. The University of Arizona in Tucson is a comprehensive institution with programs ranging from the liberal arts to technologically advanced engineering studies and about 30,000 highly satisfied and highly tan undergraduate students. Famous Chinese dissident and astrophysicist Fang Lizhi continues his groundbreaking research here, and he teaches undergraduate classes. Describe the type of student who should not attend University of Arizona and explain why. Describe the type of student who should attend University of Arizona. Why? What is a typical University of Arizona student like? Describe the type of person that should attend University of Arizona. 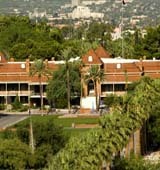 What are the top 3 reasons someone should attend University of Arizona? Students should attend the University of Arizona for their science programs, their unbelievably friendly and stimulating campus, and the relaxed and fun lifestyle that Tucson promotes. What was a typical University of Arizona student like in high school? Describe the type of person that should attend University of Arizona. The typical student was smart, fun and accepting. Everyone fits in here so the typical student should be one that works well with many types of people and is open to trying and learning new things. "The University offers "assured admissions" for in-state freshman applicants." A diverse medley of fervent sports fans, outgoing individuals, and dedicated scholars. The UA generates $530 million in research and gives the state an annual $2 billion boost. We partner with industry so that innovative ideas become thriving enterprises. What are the top 3 things that students do for fun at University of Arizona? Campus housing is available for undergraduates. Housing deposit : $350.00. Housing deposit due : Mar 1. Housing deposit is partially refunded if student does not enroll.. Freshman allowed to have car. No pets. Any instructional program in electrical, electronics and communications engineering not listed above. The average student pays $14,070 for tuition, fees, and other expenses, after grants and scholarships. Total stated tuition is $9,388, in-state and on-campus, before financial aid. Learn more about financial aid at http://financialaid.arizona.edu. Estimate the net price for you at http://oirps.arizona.edu/npc.html. The typical (median) early career salary of University of Arizona graduates is $48,400, according to Payscale. University of Arizona participates in the NCAA Division I-A for college athletics. Want more info about University of Arizona? Get free advice from education experts and Noodle community members. I am a Nigerian student aspiring to attend the University of Arizona. How do I go about completing the application process? You can start online via the University of Arizona Online Application Portal. It costs $75 for international students, and they recommend setting aside 30 minutes for the application process. Good luck!